Good morning! If you follow me, you know I’ve been upping my breakfast game since I’ve been cooking for my fave octogenarians, the folks, Pat & Chuck. These Fluffy Cottage Cheese Pancakes are one way I’m trying to improve the protein of their favorite breakfast fare. “Cottage Cheese Pancakes?” you might ask. Yes. Cottage Cheese Pancakes. And they’re absolutely delicious. Who knew? Fluffy Cottage Cheese Pancakes really are fluffy. And light. And rich. And moist. And totally delish. You can see the cottage cheese flecks in the pancakes, but they’re more noticeable in the pics than they were “in person.” I barely adapted this from Whole Foods. I’ll be making these Fluffy Cottage Cheese Pancakes again and again. They’re super easy, too, which always helps, especially in the morning. You can see that these have more calories but over five times the protein of my Best Basic Pancakes. I don’t use cottage cheese much; usually I buy it intending to eat it at lunch, then let it languish. This is a great way to use some of that “good intention” stash. As far as prices, cottage cheese can be regularly picked up on sale at a deep discount and you should be able to find coupons. If you use it, it has a long shelf life, so pick up an extra carton when it’s on sale. In a small bowl, stir together flour, baking soda, salt and sugar. In a larger bowl, whisk together eggs, cottage cheese, milk and oil. Add flour mixture to egg mixture and whisk until just blended. Lightly coat a large skillet or griddle with spray oil then heat over medium heat. Working in batches, form each pancake by spooning about 1/4 cup of the batter onto the skillet. Cook, flipping pancakes once, until golden brown on both sides and cooked through, about 5 minutes total. Transfer to plates and serve. I’ll be taking this recipe to Angie’s Fiesta Friday, hosted this week by Sarah @ Sarah’s Little Kitchen and Shinta @ Caramel Tinted Life. 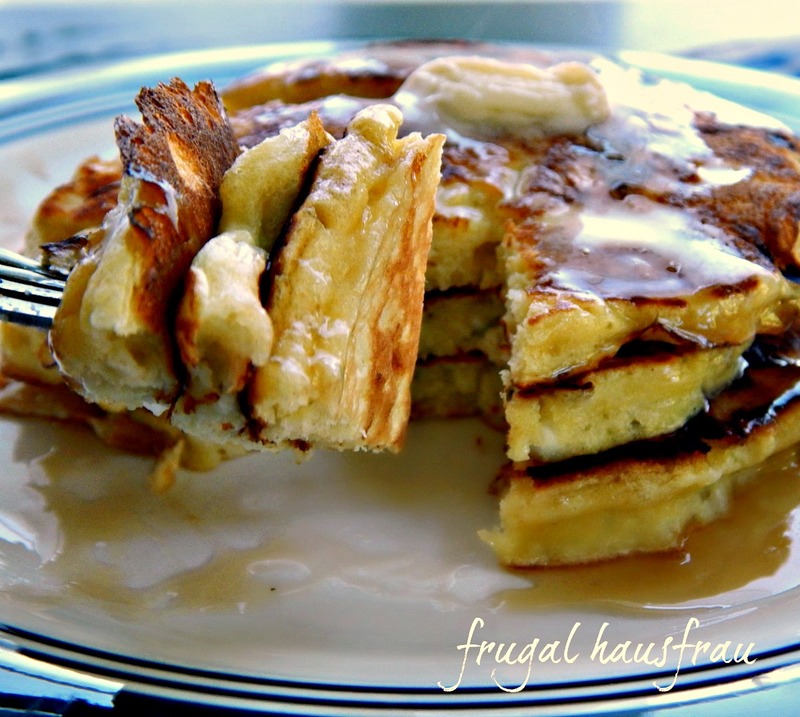 This entry was posted in Click here for Bargain Meals, Click here for Fabulous Food Posts and tagged Bargain Meal of the Week, Breakfast or Brunch Dish, cottage cheese, cottage cheese pancakes, fluffy cottage cheese pancakes, Frugal Hausfrau, pancakes. Bookmark the permalink. Not such a great pancake person (prefer savory), but yours look absolutely sinful :). I use of course my very own homemade QUARK – always have a fresh batch in my fridge. Have you posted that recipe? We can’t get quark here. I usually have to thin out cream cheese. For sure! Would not miss these! Thanks for sharing! I’m always looking for a rich pancake recipe, I think breakfast should always be done right! This one is perfect. Indian cottage cheese or ‘paneer’ is something I enjoy making at home. I’ll be trying this out soon, thanks for sharing at the Fiesta! I am going to have to give these a try. Little Dude likes pancakes on the weekends and these would be a fun variation. Cottage cheese either goes in a flash at our house or languishes. This would be great for the weeks that it just hangs around. Oh wow. these look to die for!!! Cottage cheese what a great idea, the pancakes look fantastic. What do you think about ricotta instead of cottage cheese? Love this recipe!! Fluffy– the best pancakes are that way! Got to try them Mollie!! thanks! 🙂 It would be a great use for it! Yum! I am not a plain pancake kind of person, I like them nice and fluffy with different flavors like this! They sound like a great idea. I buy cottage cheese to have for breakfast along with eggs, sausage or bacon etc but it often goes begging. Did you know you can add cottage cheese to your donut dough too. It’s the most important element of the traditional Romanian donuts called ‘papanasi’. 🙂 I think we should all be doing that! Since I’ve been at the folks I don’t know how many pounds of sugar and butter we’ve gone through in baked goods! It would probably be scary if you totalled it all up! Pat has such a sweet tooth. It’s incredible. She’ll finish off a quart of ice-cream in a day and one time ate 14 muffins in an afternoon. If I don’t bake, she’ll eat all store bought stuff (which I figure is even worse than home-made.) Cupcakes, muffins, packaged hand pies…I’ve never seen anything like it – and her weight is pretty much steady.??!! I’m with Jess. Oh yum! Those pancakes could float they look so light. Hugs. lol! I’d be happy to!! 🙂 But I get to stay in my bathrobe, right?